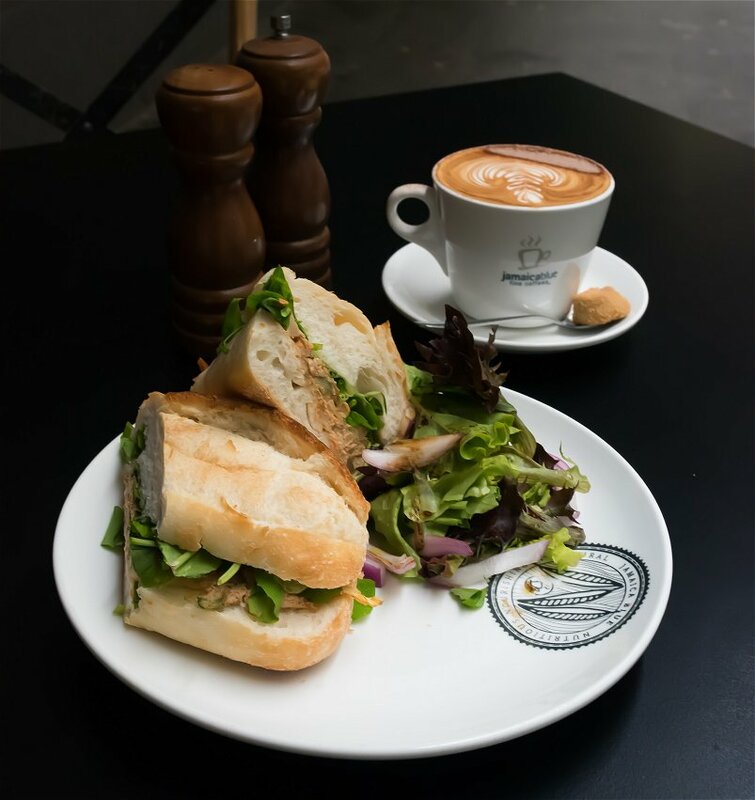 Rundle Mall’s Jamaica Blue has long been known as a contemporary casual dining option for shoppers, businessmen, students, and families alike, with its prime location and sprawling windows overlooking the ground floor of the Myer Centre. Jamaica Blue rotates their menu every six months to ensure customers are always happy, changing up their dishes to include seasonal ingredients that complement the current season. The latest menu has kept some old options while introducing some new ones and harnesses some beautiful, light ingredients, becoming a perfect fit for the summer weather. Jerk Pork & Crunchy Slaw Roll – If you’re looking for a nice and quick breakfast or lunch option, look no further than Jamaica Blue’s sandwich rolls! Think of your traditional pulled pork sandwich. Now add an Asian-inspired twist and you have the Jerk Pork & Crunchy Slaw Roll! The jerk-spiced pork is served with a blend of carrot, carrot, cabbage, cucumber, coriander, bean shoots, and creamy chipotle. The crunchiness of the vegetables and slight kick of the spiced pork provide for an interesting host of sensations for the palate. Did we mention this dish can be had toasted or fresh? 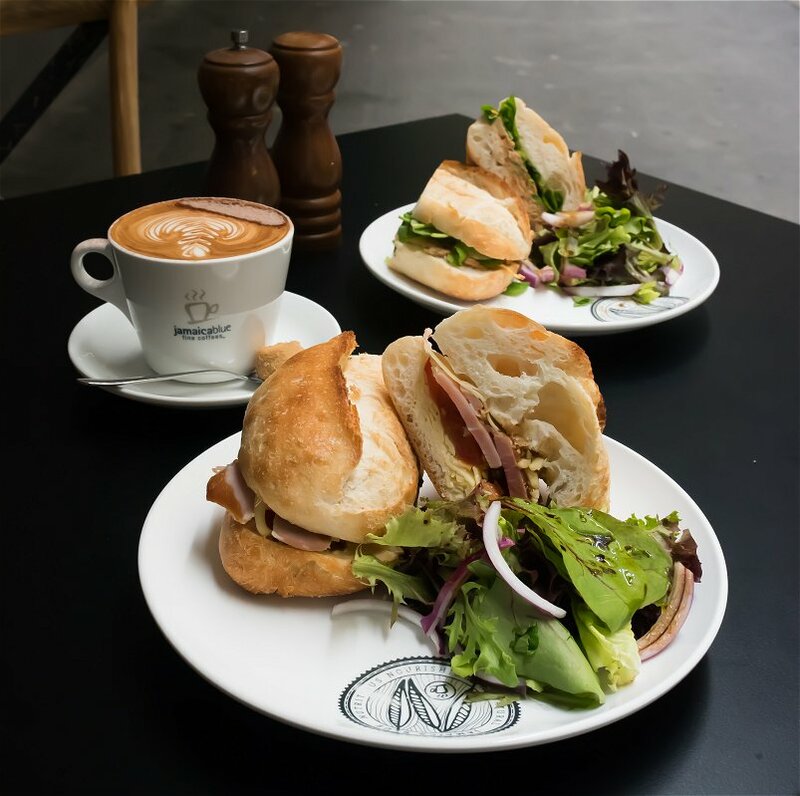 Christmas Ham & Coffee Chutney Roll – The second sandwich roll option (also can be had toasted or fresh) is what can be described as a step-up from a traditional ham and cheese sandwich. The freshly sliced Christmas ham is served with parmesan cheese, tomato, and a house-made Caribbean coffee chutney. The addition of sage creates a powerful flavour that mixes well with the other, more subdued, flavours. The coffee chutney’s interesting taste blends a myriad sweet sourness, with a hint of spice and coffee notes lingering in the aftertaste. We’ve certainly never had anything like it before and Jamaica Blue have bottled and are looking at selling the chutney closer to Christmastime so make sure to keep an eye out for it! 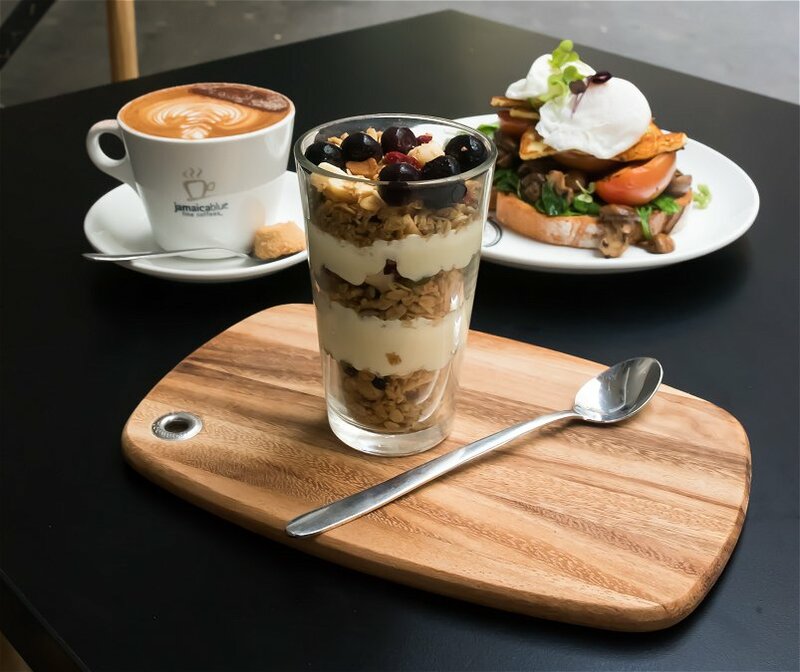 Mango Muesli Parfait – This breakfast parfait is the absolute perfect way to start a hot summer’s day. Perfectly presented in a tall, polished glass, layers of macadamia muesli and mango & vanilla yoghurt makes a dish that is both delicious and beautiful! With nutritious muesli and low fat yoghurt, this parfait makes for a nice, light breakfast option. It looks healthy and tastes healthy, what more could you want? Light Breakfast – Another light option, the perfectly named Light Breakfast offers a happy compromise between traditional and contemporary. 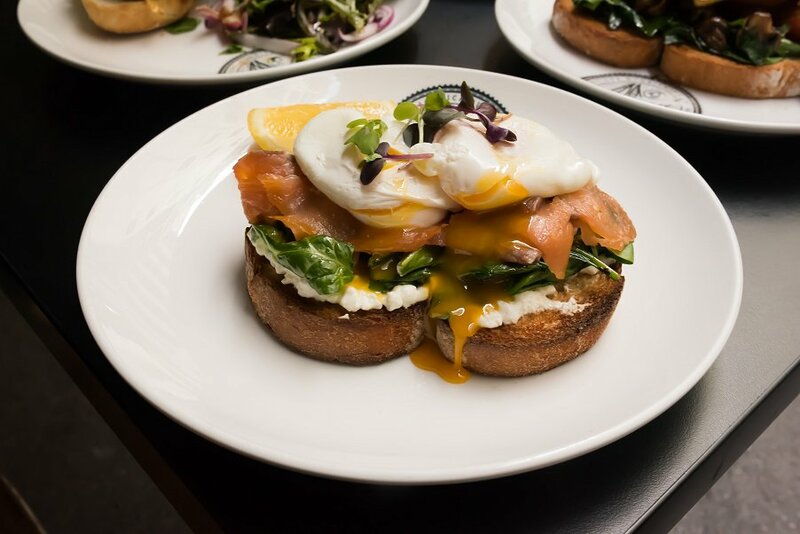 This dish is simple yet elegant, featuring smoked salmon and spinach served on lemon & chive cottage cheese spread toast, topped with two poached eggs. The blend of flavours is balanced and well-thought out, with the zestiness of the cottage cheese complementing the saltiness of the smoked salmon. 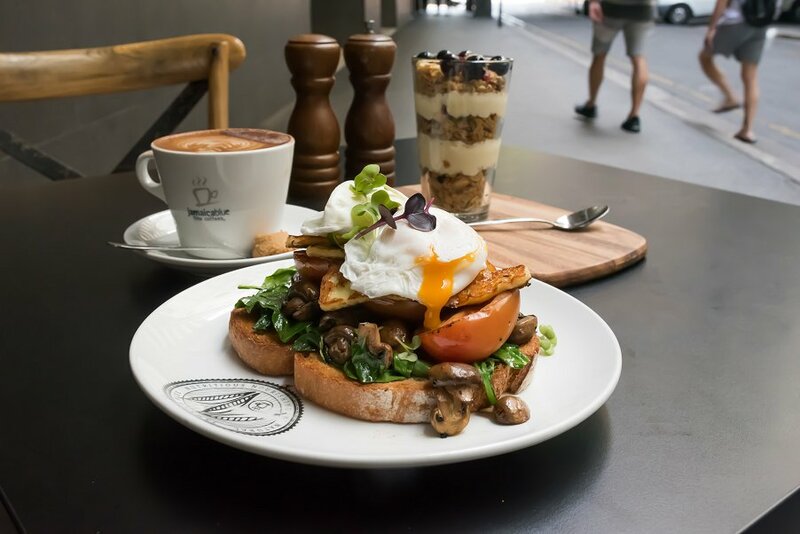 Vegetarian Breakfast with Poached Eggs – This dish is everything you could want in a big breakfast – toast, mushroom, roast tomatoes, grilled halloumi, and, of course, poached eggs! Being a completely vegetarian dish doesn’t mean it’s lacklustre in flavour. In fact, it is anything but! The mushroom and halloumi cheese add the perfect amount of saltiness to the dish while introducing more textures at the same time. Not to mention the pesto on the toast adds the finishing touch that pulls the whole dish together! 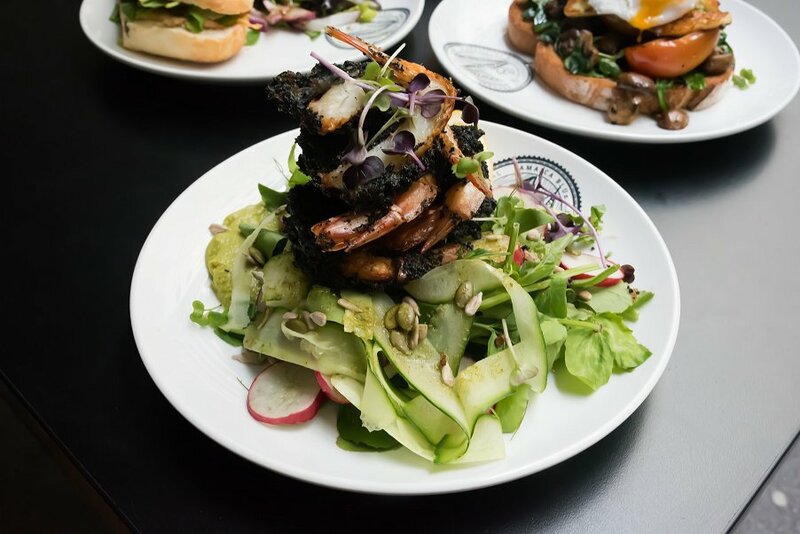 Charcoal Crumbed Prawn & Avocado Salad – Definitely the most interesting-looking of the bunch is the Charcoal Crumbed Prawn. The panko-crumbed prawns are infused with charcoal and bamboo powder, giving the prawns the blackened colour on the outside. The prawns are served on a generous bed of soy bean, shaved cucumber, coriander, seed mix, and radish salad, all atop a creamy avocado spread. The contrast of textures is to be commended in this dish, with the crunchiness of the outside of the prawns playing well with the succulent inside, and the salad providing a cool and light relief to the palate. Definitely one to check out! These delicious dishes paired with a cup of Jamaica Blue’s renowned coffee will definitely have you coming back for more! Jamaica Blue is located on the upper ground floor of the Myer Centre in Rundle Mall and is open 7:30am-5:30pm Monday-Thursday, 7:30am-9:00pm Friday, 8:00am-5:00pm Saturday, and 10:30am-5:00pm Sunday.